This is a touching first world war story of a close knit army unit sent to the front line and the woman left at home in Accrington. Originally premiered by the Royal Shakespeare Company, this moving and hard hitting play is a timely and gritty reminder of the triumph of humanity amidst disaster. 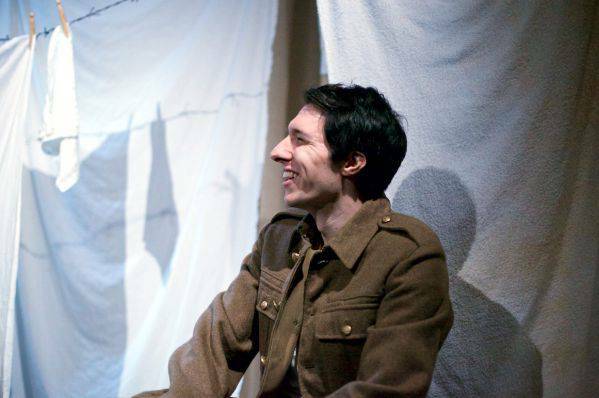 Don’t forget, in partnership with this production, as part of this special remembrance part of our season we are also presenting ‘Oh What a Lovely War’ on our main stage. For more shows and information you can also view our online Brochure? Please check with our Box Office Direct for any returns for this show. From a Garrick member for Monday night. ? 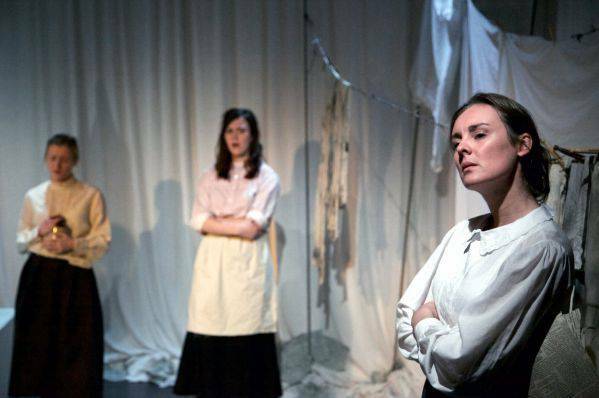 "I think it is difficult to say I actually enjoyed it because though there was plenty of humour and the cast acted their socks off, the subject matter was emotional rather than entertaining. The atmosphere that was created by you all was such that at the end it felt wrong to applaud but better to stand in silence and file out with bowed heads.I think that achieving that effect could be considered a total success." 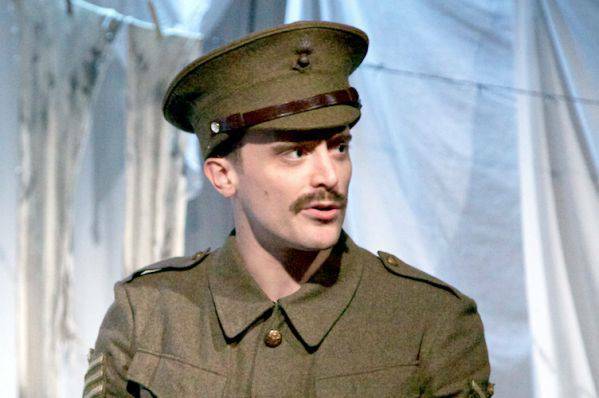 Just back from tonight's performance of Accrington Pals. 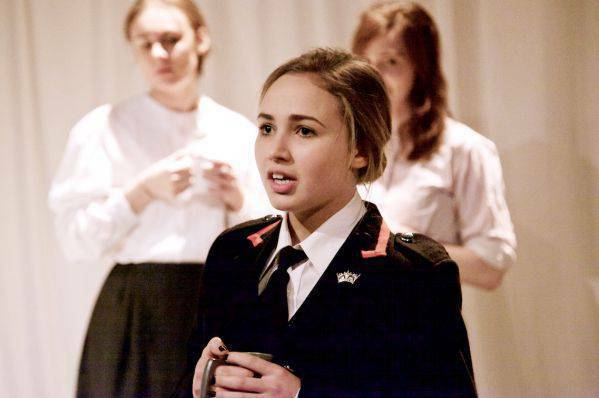 It was possibly the most moving piece of theatre I've ever seen. The whole cast were mesmerising. Please pass on my congratulations to cast and crew. 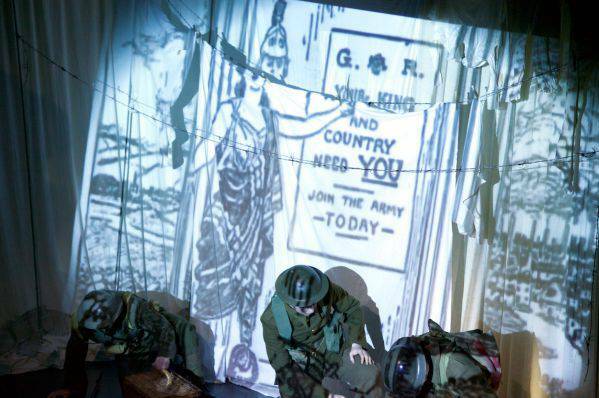 It is fitting that the Garrick should present The Accrington Pals a century after the start of World War I. It?s about a northern town ? Accrington ? the smallest town in England , who, in reality, raised a 720 strong Pals Volunteer Brigade. A sad fact is that 584 of them were slaughtered in The Battle of the Somme. 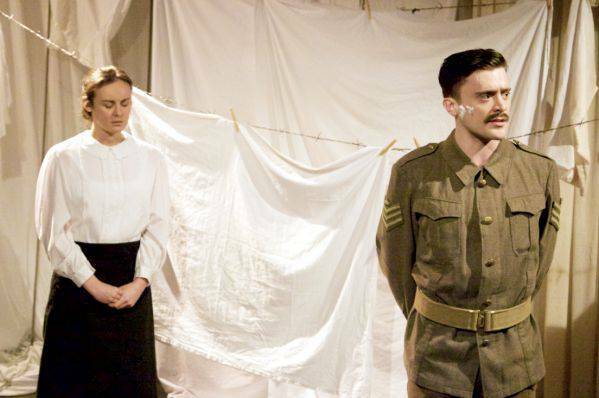 Peter Whelan?s play builds on the truth, to create the effect that these events had, not only on the young soldiers but the woman they left behind. 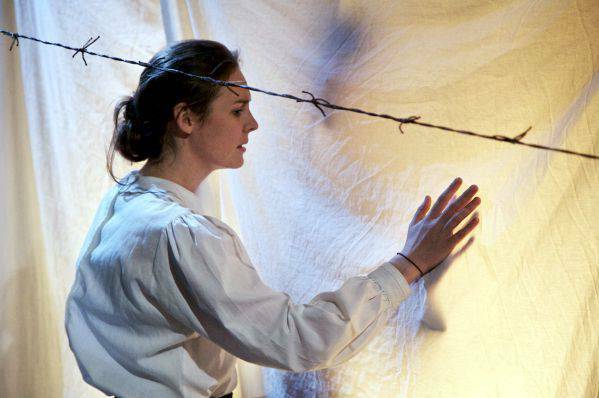 John Chidgey and Ros Greenwood?s production captures the horror of the war and the bravery of the people affected. 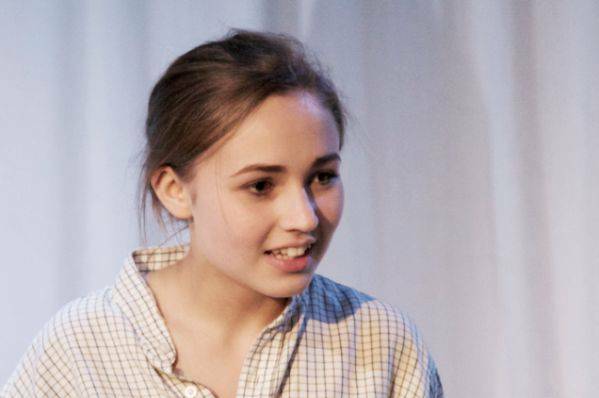 The solemnity and passion of the young cast is excellent and yet they make the most of threads of humour with exemplary Accrington accents. As well as the relationship between the soldiers with their women, the camaraderie of the men as they endure the horrors of war and the closeness of the women pining for them is captured well. 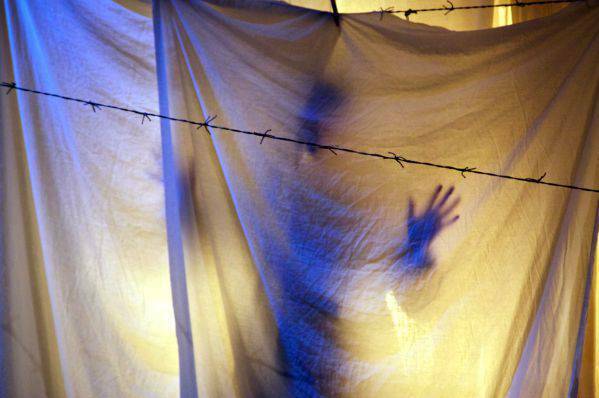 Thanks to the technical team, we have, not only the sound effects of war but visual images cleverly captured on the white sheets of a washing line. Apart from the washing line, the central item on stage is a war memorial on which flowers are placed in remembrance of those lost. The tragic male hero is 19-year-old Tom, the adopted brother of May who is ten years older than him. For moral reasons they don?t set a foot wrong, but the sexual attraction between them, conveyed by subtle glances is tangible. 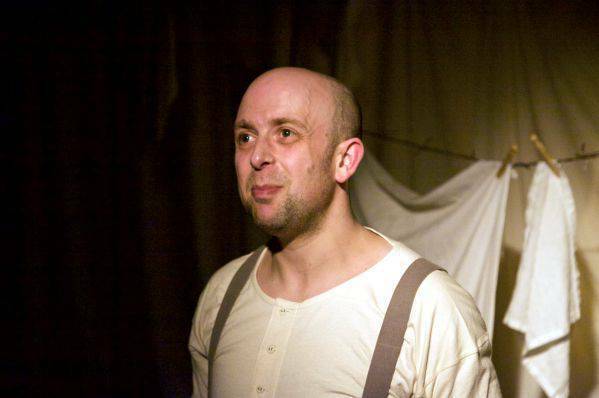 Tom, played by Charlie Maguire, captures his character?s sensitive idealism which makes him totally unsuited to the tough life in the trenches. May (a feistyVicky Siddle) remains single She is the strong one who takes her job of selling vegetables from a barrow, seriously and hopes, one day, to open a shop. She seems able to tackle anything and leads the other women, mostly mill workers, throughout this dreadful time. Her frustrated desire for Tom hardens her heart so much that she no longer believes in love. 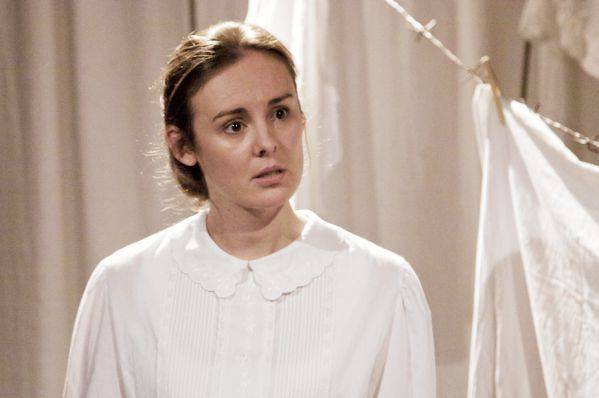 Her best friend, warm-hearted Eva (Rachel Isbister) is more successful in that department, and pairs with Tom?s pal, Ralph (Matthew Roughley) movingly scrubbing his back in a tin tub before he, too, goes off to war. Rachel?s brief rendition of Jerusalem is beautiful. Other interesting characters come from the Boggis family. Born-again Christian, Arthur (Leon McKenna) is married to a woman from hell (Emily Duffy) who resents her learning disabled son, Reggie (Leif Black) and takes out her anger on him. 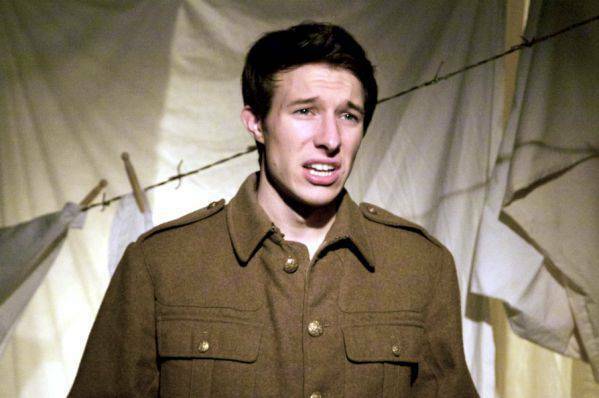 Anthony Morris as Rivers the veteran soldier, conveys a non-commissioned officer who is totally dedicated to his men. 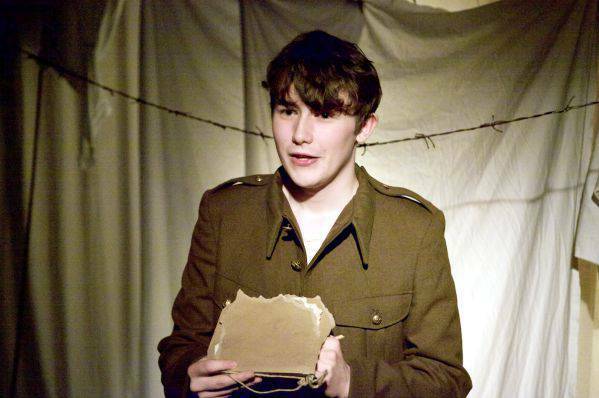 The youthful cast bring World War I to life and help the audience to empathise with its effects. No wonder it?s a sell-out! First?premiered at the Warehouse, London back in?April 1981 by the?Royal Shakespeare Company? (though not published until one year later), Peter Whelan?s extremely moving World War I?drama is a?stirring tribute to a once?close-knit community of ordinary people wavering on the brink of constant change, and feels particularly profound in this?First World War?Centenary year. On the eve of the First World War the young men of Accrington hear Kitchener?s call for a New Army and subsequently become the smallest town in England to raise a Pals Volunteer Brigade. ?Upon?arriving in France, the brutal reality of the trenches is far beyond anything they were prepared for. Back home amongst the women they have left?behind ? mothers, wives, daughters, lovers ? nothing can ever be the same again. ? 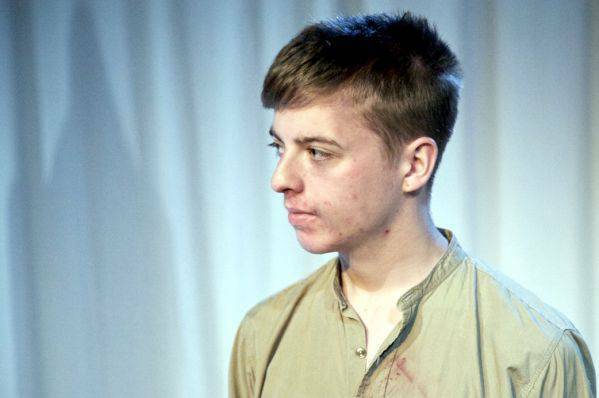 The play spans a period of around two years, from?the?700-strong Accrington battalion?marching off to the Western Front in August 1914 through to the Battle of the Somme in April 1916. 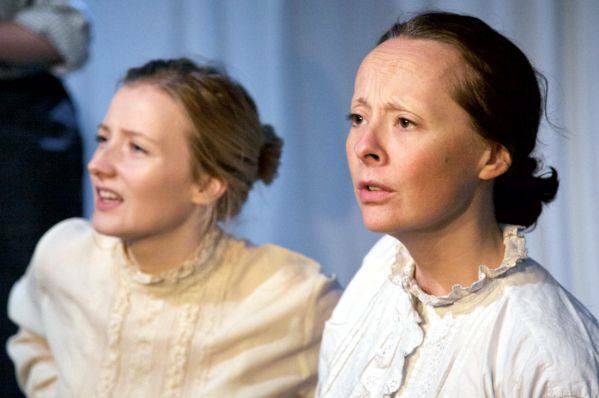 Unusually, however, the play is not so much about the men, but rather the town of Accrington itself, and the journey and increasing unification of the women they have left behind as they adjust to their new roles. Whelan manages the admirable task of cramming the piece with a vast array of economic and socio-political?issues and war-related themes, but without ever actually laying blame or making things seem overly gratuitous. 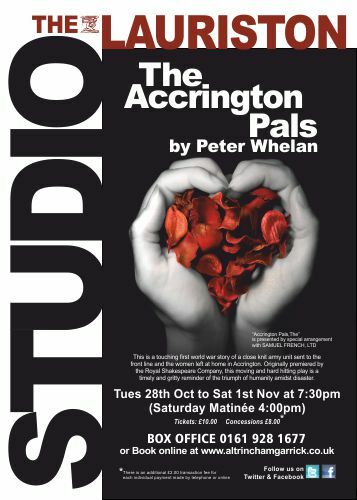 It is quite a challenge to stage a piece as complex as The Accrington Pals in the intimate confines of the 49-seat Lauriston Studio, however helmed by the directorial team of John Chidgey and Ros Greenwood ? and played out on a minimalist, though very effective white-box set (also designed by Greenwood) ? everything about the production just works. The almost claustrophobic intimacy which the studio setting presents only works towards enhancing the sense of familiarity and solidarity between the characters, further reinforcing the various tones and underlying themes presented. 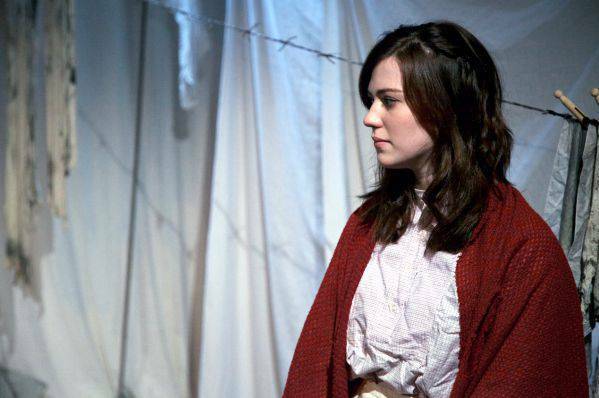 One of the play?s key strengths is that it achieves a very fine balance between warm humour and hard-hitting pathos, perfectly capturing the various contradictions of the time and delivering a powerful and very authentic feeling examination?of contemporary small-town life. Whelan constructs his dialogue with an almost poetic flair and his use of satire and dramatic irony are particularly effective. The production?s closing twenty minutes or so are?amongst the most eloquent and heartrending I have witnessed on stage for some time. The closing image of young Reggie, stood alone by a darkened cenotaph, is beautifully achieved and serves as an intense reminder of the devastating?loss and waste of so much community patriotism and local pride. The predominantly young ensemble cast of ten are very strong throughout, so it would be unfair to single out individual performers. 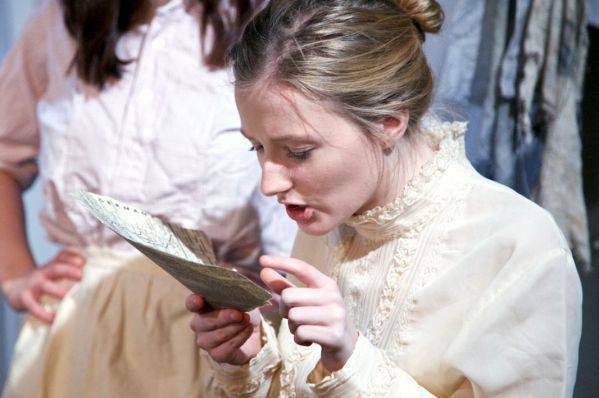 Glancing through the biographies in the programme you may be surprised to learn of the relative inexperience of many of the cast, however I have to say that any such lack of stagecraft or experience is?by no means evident.